(Silver Age) member of the Penance Council of the V-Battalion; , member of the All Winners Squad, possibly founder of the villain-killing Scourges (see comments). Powers/Abilities: Able to fly / glide using his cloak, the fabled "Cape of Mercury". Skilled fighter. Knowledgeable in a wide variety of fields, especially the underworld. 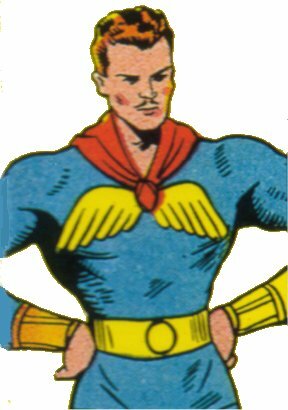 History: (Marvel Mystery Comics #20, ga, text) After his mother died during childbirth, Thomas Halloway was raised by his prison warden father, actually growing up in his father's workplace. As well as being taught by tutors brought in by his father, the youth also befriended and learned from many of the inmates, gaining what would prove to be a valuable understanding of the criminal community. When he and his childhood friend Bob discovered that a prisoner was to be executed, they managed to intervene to save him. The grateful man described his saviour as an angel. When Thomas reached adulthood he decided to become a private detective, and also adopted the costumed identity of "The Angel" to fight crime. (Marvel Comics #1, ga) The Angel tracked down the racketeer known as The Big Boss. (Marvels #1) Daily Bugle photographer Phil Sheldon spotted the Angel patrolling the roof tops of Manhattan. (Citizen V and the V-Battalion I #2) After the War, the Angel was one of a number of heroes who formed the Penance Council, the ruling body of the V-Battalion, dedicated to fighting the rise of dictatorships and other threats to the world. (Citizen V and the V-Battalion II #1) In 1953 the Angel attended the funeral of his friend John Falsworth, the Union Jack of World War II. 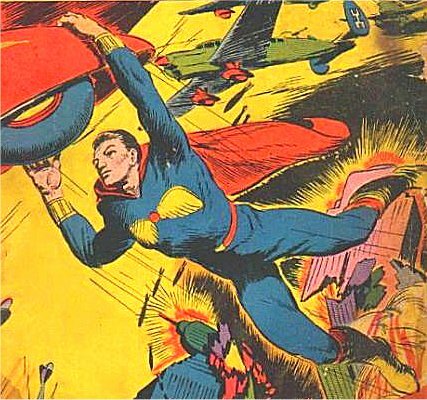 Comments: Created by Paul Gustavson. Among the other people who worked on the character over the years was Carmine Infantino, who would become acknowledged as one of the greats of the industry. (Marvel Super Heroes III #7, Incredible Hulk #432) Thomas Halloway fell on hard times after the war, eventually becoming a tramp who lived in the New York Sewer System. (Captain America I #442) The villain Zeitgeist tracked the aged Halloway down, and killed him. (USAgent #4, bts) After an bystander was killed, the Angel hung up his cape, unwilling to risk more innocent lives in his fight against crime. Still wishing to combat lawlessness and seeking a way to atone for his mistake, he eventually founded a group of trained assassins, the Scourges, who would ambush and murder costumed criminals. 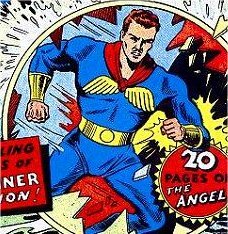 Strictly speaking, the Angel's first post-Golden Age appearance was in Avengers I #97, when Rick Jones summoned forth mental projections of a number of Golden Age heroes, Halloway among them. Thanks to Brad Newman for permission to use images from his Comic Book Cover Quest site on this page. Angel, man with an inbuilt computer, from 2000 A.D.